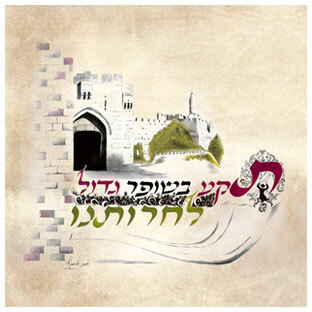 Welcome to the home page of Esther Abramowitz’s Judaica Artwork from Jerusalem. 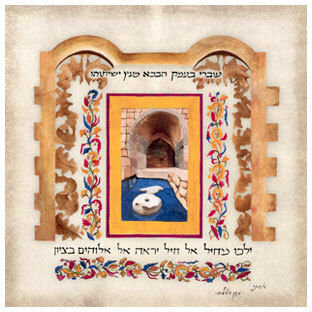 Enjoy our beautiful selection of pictures related to different Jewish themes drawn from the Jewish prayer book and Scriptural verses. Every Jew has a special affinity for Jewish art, in particular works with texts from traditional Jewish sources. In Esther’s collection, everyone is sure to find the exceptional picture whose message speaks especially to him. Jerusalem scenes accompanied by Scriptural verses. Eishet Chayil – A Woman of Valor. Birkat HaBayit – A Blessing for the Home. 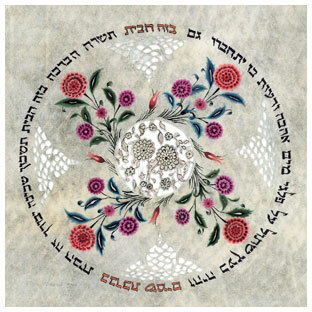 Sheva Brachot - The blessings recited for a bride and groom. Tefillat HaRofeh – The Physician’s Prayer. Nishmat Kol Chai - A prayer of thanks and gratitude to the Al-mighty. Sukkah decorations based on Scriptural verses. Selections from Tehillim (Psalms) and the Prayer Book. © All rights reserved to Esther Abramowitz.